A short history of possibly the largest slave uprising in the United States, in Louisiana in 1811, written by Rhae Lynn Barnes. Although the slaves under Deslondes’s leadership possessed very few firearms, they engaged in combat with the local militia led by General Wade Hampton I (1752–1835), a plantation owner, three days after the rebellion began. Hampton had responded to a call from William C. C. Claiborne, the governor of the Territory of Orleans, to suppress the revolt. 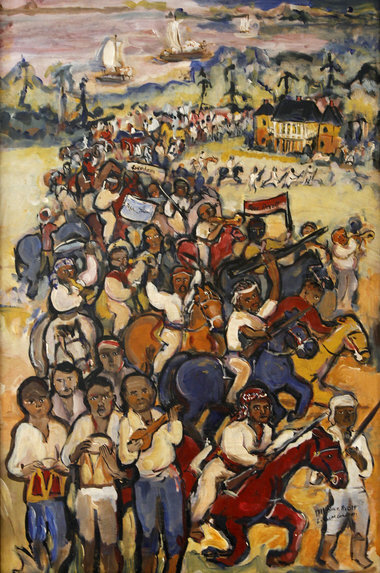 A second brigade from Baton Rouge, under the command of Major Homer Virgil Milton, was also roused to combat the slaves. The two militias merged the following morning, 11 January 1811, near Francois Bernard Bernoudi’s plantation. The slaves fought with pikes, hoes, and axes. They carried banners, marched to the beat of drums, and were broken into subunits that each had individual leaders on horseback. The slaves wreaked havoc on the region, set plantations on fire as they marched towards New Orleans, and recruited additional slaves, while white residents fled to the city of New Orleans or the backwoods nearer their plantations. At the end of two days’ fighting the militias had largely quelled the rebellion and captured Deslondes and other rebels. Some estimates from white officials and journalists at the time claimed that sixty-six rebels were killed, with a further sixteen arrested and seventeen missing, though that number may have been higher. Deslondes was executed on 15 January. His body was mutilated, dismembered, and put on public display as a warning against other attempts at slave uprising. The substantial number of former and current slaves who witnessed the success of the Saint-Domingue slave revolt undoubtedly posed a constant threat to the region. Newspapers across the country chronicled the event in gory details. However, the national historical memory of Charles Deslondes and the German Coast Uprising pales in comparison to the much smaller revolt known as Nat Turner's Rebellion that took place in Virginia in 1831. This is most likely because Louisiana, at the time, was a very recent annexation into the United States and therefore still seen as untamed territory where violence and lawlessness could be anticipated.